Successfully Added USB LED Backlit Keyboard (Assange Aquamarine Edition) to your Shopping Cart. Features: This keyboard is so much better than ordinary computer keyboards because the keys come with both green LED and blue LED backlighting...so you can even type in the dark! Try it out. Turn off the lights, start typing, you'll feel like you're Neo from the Matrix! The scroll button allows you to toggle between green backlit keys or blue backlit keys. You can even turn off the backlit keys if you want...but why would you want to? Design: This Assange Aquamarine Edition keyboard comes with a clean minimalist design for all you keyboard cowboys out there. Whether you're leaking top secret documents or just answering email, this is the keyboard for you. 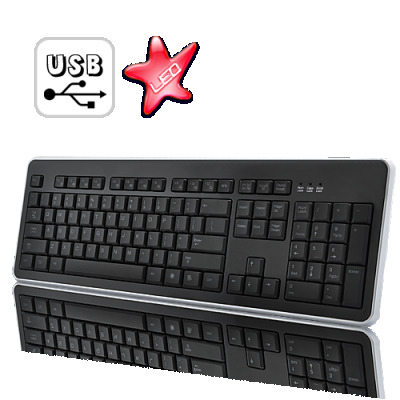 Comfort: The K138 USB LED Backlit Keyboard has easy access controls and an over-sized layout where each individual key is a bit bigger than average for maximum comfort. Press on the keys and you'll really notice the difference. You'll be spoiled with such a solid, springy keystroke experience, you'll never use another keyboard again. Add to cart and hit the enter key on your old crappy keyboard today and in a few days you can replace it with this awesome Assange Aquamarine Edition USB LED Backlit Keyboard! Will this keyboard also work on a MAC computer? Yes, this LED keyboard will work on all Windows, Linux, and Apple Computers.